Hyperion can be guaranteed to disinter rare, previously unrecorded material for their various series. 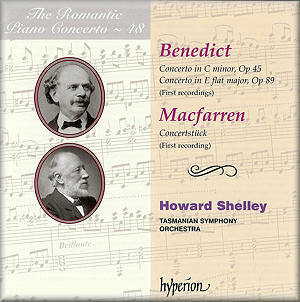 It has done so again here with three previously disc-free works in the volume in their Romantic Piano Concerto series. Julius Benedict is the focus, one of the German-born colossi of Victorian Britain. The student of Hummel knew how to construct a strong, powerfully argued concerto, as he shows in both these examples. In the case of the C minor the compositional axis is, I suppose, late Mozart-to-Mendelssohn but with more of the latter. The piano enters after the briefest of orchestral introductions and soon unveils a delightful second subject. The writing is fluent and fluid, virtuosic in places, and strives toward stormy petrel buffeting. A strong contrast comes via the warmly hued slow movement, a romantic reverie, really, in which an allegro section offers contrastive panache before we return to the refined allure of the opening. The finale is perhaps the most outstanding movement for its sheer catchiness, and its sprightly, striking avuncularity. True, we get the dreaded fugal feint but there’s plenty of verve and drama here and the fugal section is, ultimately, neither academic nor over-balancing. The E flat major concerto was premiered by Arabella Goddard in full in 1867 - it had a long gestation but was clearly written much earlier. There’s a nice, veiled warmth about it though it’s cast in a rather more conventional mien than the companion concerto. There’s plenty of fulsome filigree and a decided whiff of his old teacher Hummel’s elegant eloquence too. There’s a surface superficial resemblance to Chopin, or possibly Field, from time to time in the slow movement, but in the main the temperature remains cool and precise. The finale is fine – terpsichorean, lightly orchestrated, substantial, digitally testing. The pendant is the Concertstück in E minor by the less well known of the Macfarren brothers, Walter. This was composed and premiered in 1881 and it’s decidedly Mendelssohnian in orientation, much more so in fact that Benedict. But it too is artfully constructed, packs in a lot of variety and contrast, and certainly doesn’t outstay its relatively brief welcome. Howard Shelley’s playing and directing is terrific and the orchestra plays with requisite bravura and sensitivity. First class recorded sound and notes as well. Admirers of the genre have no cause to doubt the commitment of all involved.